The shopping mall is headed the way of the drive-in movie and the eight-track. What's replacing it? NEW YORK (CNN/Money) - If you spent your formative years at the local shopping mall sipping Orange Julius and hanging out near the ubiquitous water fountain, you might be sad to learn that the mall as you know it is headed toward extinction. Before: When it opened in 1966 Villa Italia was ahead of its times. It's now being rebuilt as Belmar. After: Belmar will be more than just a mall when it opens next year. So cities and developers have begun breaking up old malls, turning their inner corridors into streets, bringing the storefronts outdoors and integrating them with the rest of the city. "Because they're often small, older malls can't provide the same options for consumers," said Bill Anderson, vice president with consultancy Economics Research Associates. "But once they're redeveloped there is an opportunity to attract the growing number of people who are frustrated with driving everywhere and want more pedestrian areas." The Winter Park Mall in Winter Park, Fla., was a classic case of a dying mall. 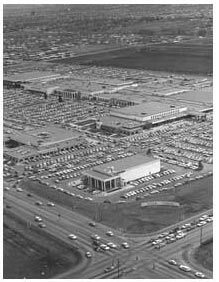 The 400,000-square-foot mall was located in the heart of the city's downtown. But with all of its stores facing in and a huge parking lot surrounding it like a moat, it was completely isolated from the rest of the town. As the nearby downtown shopping district thrived, the mall failed. In the late 1990s, a new owner, the city and local business started making plans to break up the mall. Several phases into its makeover, Winter Park Village, as it's now called, is not unlike its surrounding downtown, with apartments, restaurants, a fitness center, a movie theater, a supermarket, office space and, of course, retail. There are similar examples from across the country. Since local governments are loath to see a mall go belly up because it represents a huge loss of tax revenue, many are teaming up with developers to make sure the space is put to the best use possible. "You're talking hundreds of thousands of acres of land that should be redeveloped," said real estate developer Will Fleissig, co-founder and partner with Continuum Partners. "Doing nothing with them is not an option." Lakewood, Colo., for one, is playing a large role in the redevelopment of Villa Italia, which was the largest mall west of Chicago when it was built in the 1960s. By the early 1990s, however, it became clear that the 100-acre dinosaur could not compete with the area's newer malls, in part because it was not near a freeway interchange and did not have the space to surround itself with big-box stores. 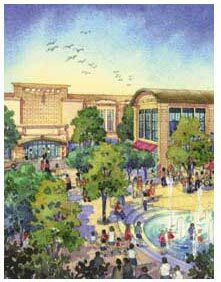 In 2001, most of the mall was demolished to make way for Belmar, a mixed-use development that will have less retail space but nearly double the square footage. When complete, Belmar will be an extension of Lakewood's downtown, linked with city streets, bike paths and walking paths. And by putting housing, entertainment, office space and parks into the mix, developers are creating demand for their retail tenants. Even if you don't plan to go on a full-blown shopping spree, you might just pop into the Gap for a new sweater while on your way to dinner or a movie. Or so they hope. © 2003 Cable News Network LP, LLLP. An AOL Time Warner Company ALL RIGHTS RESERVED.